I have gone back and forth with writing for a few days now, there has been another change for me this week and I didn't handle it well... unfortunately that is the way I am, I have been working on that but it takes time. When sudden and life altering changes happen, I freak out but I always get to the stage where I work out a way through it, then I am okay. What I have learned from this last challenge is that I don't freak out as much as I would have in the past because I know there is way through. I realized that this is not how I have always portrayed myself to people that I know unless they are a close personal friend. I wondered if that was the way I wanted myself remembered? The thing is that I am more myself here on the blog than I am with most people... because I have a hard time trusting that people won't be who they say they are... or who I know them to be. It was at this moment that I knew we all wear masks to the world of what we want people to see. Sometimes you meet a few rare people in your life that you can open up to and be yourself and know that no matter what it's okay, they will be there for you always... just as you would be there for them. Then the unthinkable happens and everything you think you knew is gone... It was never as you thought it was... it makes you question everything and everyone. I think that's one of the toughest things about falling in love as you get older. Everyone's been hurt in the past and is slow to trust. A change in behavior begins with a change in the heart.Have a nice day Launna! I can totally relate to this post. I usually create barriers to people do to my past experience and I know that's not healthy but I am working on that and your post really motivates me even more. I missed your beautiful and inspiring posts a lot. I was away for long. Whenever I read your post I get inspired. I wanna share one good news to you maim; that is, for the project that I was doing in college, I wrote a conference paper for National Engineering and Architecture Conference in Bhutan. The paper got through and my guide presented and it was well delivered and received by the audiences. SO in this regard I want to thank your kindness for the reference book that was emailed to me long ago. Thank you very much and hope you will constantly keep me inspiring by your beautiful write-up! You are a Woman with a big good Heart! Take all the time you need to trust someone Launna! Trust is such a fragile thing. So easy to be broken and can takes so much time to build or get restored. This quote "I cherish my past, I accept my present..." is very amazing. You are a beautiful and lovely woman and you deserve all the time you need to trust someone. It is not always easy to trust Launna, but in order to change and improve you must take risks and believe it .... you're a strong woman with a big heart! Pretty photos, have a beautifull week! Happy Monday & I hope your week is a beautiful one. Yes indeed. Changes begins with ourselves. I hope you're doing fine. Dear Launna, I hope the woman who's giving you such a a sorrow is vanishing. Are you letting her go away? I know how hard it can be to trust again and to handle disappointments in general - stay strong Launna! Just remember not to blame someone new for the mistakes of someone old! You have come a very long ways -- just keep goiong. I have to admit that I freak out whenever I see a change in my life. I used to have a hard time embracing changes because I thuoght they weren't for good, sometimes I was right, sometimes I was glad I wasn't. But all in all, I learnt that that's the way life is and yes, the best changes begin with ourselves. I hope you can start trusting people little by little :) you'll eventually find someone who's in the same search for a trustworthy person, too. In the past, I have also very cautious about what I share with people I know in real life. However, I have found that the more honest you are, the more people are honest back. I've also found that I actually get more respect by admitting the emotions I am feeling about something! It feels good to not have to hide who I really am. Sounds like you are doing that too! The only humans that like change are wet babies. I've discovered through the years that the pace of change accelerates the older I get. Many of the changes I don't care for, but they change anyhow. Also, there will always be shallow people who will use you. It's best to know that and whenever you feel you're being used, move on as best you can. You've done a great deal of growing since I started following you. I think you are stronger now than ever before. Change does take time! And I like your attitude and insight. These are some cute quotes! Hi Launna, it's difficult to trust people again. However I think it's the best way to enjoy friendship. Have a lovely week! I know I'm the worst when it comes to change. I don't do it quickly. I get how it is to trust people. Even when I was really little, I would be so paranoid. Of course, I was bullied when I started school. Actually, it was the Mean Girls..who were a grade or two older. Oddly, I fell in with two boys as my best friends. It is a bumpy journey where friendship will take you. But I think of my one friend and what he said to me, "You need to smile more. Be brave." it's great to read that you are choosing to trust again dear! 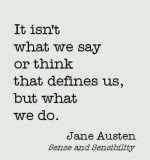 I love that quote that "it isnt what we say that defines us, it is what we do." Actions speak louder than words! I think it's also important to remember that people fluctuate. They may be awesome and outgoing one day, and withdrawn into their own trials the next. Sometimes what we see is them doing their best, even when they don't have quite enough to give. It's so easy to have our feelings hurt, but it is a choice. My husband is awesome at reminding me about that. So true..I'm the kind of person who really despises change, even though it's the only thing constant in life..I always have a hard time trusting people, I'm sure we all have met people who we thought were friends but turned out to be fake..
All of us wear masks to an extent; parts of us we don't want the world to see we hide behind a false exterior. There are very few people I can open up to fully myself. It's same here my dear Launna. I wanted to post as every other days, it seems the more I try the more less time I got left, so I've got to do what I can:). You're studying Launna, that's why:). I've rarely said a word " Hate" I'm going to say I don't really like how people can pretending themselves instead of being real. although, that's not my problem at all - I don't really waste my time to think about that, I also telling my kids - they've to prepare for those who masked. but, it is a life, as long as we good, Those people aren't good to themselves, I don't know why not being real "real is unique and is you yet freedom. Enough said my lovely Luanna. I'm not a sweet talker but what and how I talk "its a real me" who I really am. we don't have to talks sweet to have other love us, not me. I'm glad you've pointed this out, and I love your voices here.:). Have a real blessed Tuesday sweet Launna. hope the studied didn't gave you too much of headache! a vida muda em todas as maneira. Think twice before trusting anyone with your thoughts and feelings. Actually, think way more than twice. People will surprise you. Have a lovely day Launna! You are moving in the right direction. Trust is a difficult one if you have been burned by others (and I know you have). You'll find it again…it just might take a bit longer the second time around. Its good to trust again but be careful who you trust!! Have a great day dear. Good for you. I am very cautions with who I trust. I can leaner a thing or two from you. Mi piace moltissimo entrare nel tuo blog , imparo tante cose. have a nice day swettie!!! I believe you will find that person. You'll become a team, a partnership, lovers and the very best of friends. He is out there. I find your line about how we all wear masks. I've never thought of it in this way. I've always believed I wore one, attempting to blend in with the masses never minding that I'd lose my own identity. I've never imaged others around me could potentially be doing the very same thing. ciao, buona giornata sei sempre bravissima. Whatever happens happens for good! Launna I can relate to you accepting challenges and not been able to handle it well. I'm going through a similar phase and at times it makes me sad and frustrated and makes me wonder if I want so many things in life which I might not be able to achieve. However, I've always seen positivity oozing out of you and I believe a positive attitude has a way of showing one the light to go ahead and I'm sure that will always happen if you maintain that positive energy! hi my dear launna... i see, much of us tried to looks like what we want to be. we use a mask to made ur character. i do it also. some times i felt its not like the way i am. but what i can do? i must do it for protect my self. i can felt it, i know you are a kind women, by read your blog, i know this the way you are. i felt as you tell me what happened with you. what you felt, what you thought. and i can't found a lie or mask there. i really proud of you even thought it was difficult for trust the other but you are choosing to trust again. i prayed for you to found some one special like what you want. :) hope the best always for you my dear. I'm sorry to hear you're going through something difficult. I do have faith in you that you'll work it out, but that doesn't mean it's easy in the meantime. Hugs to you from me, and lots of nice thoughts too!! Hi lovely Launna. I came here last night but by the time I was going to clicked my comment through and that my phone's batteries ran out, then I wen to bed with my wasn't succeed day:). Now, I'm going to make it succeed and wishing your day is as pretty as you Launna. I wanna write you more than this but it's time to go pick up the boys:). Ps, I'd also want to meet you too my sweet Launna. Stay positive:). oxoxo. Life is short, live your life the way you want to live it! Have a nice day Launna! Hey Launna dropping by to say "hello". And thx for the RT:). I was busy then after landed my post - willing to RT back tmrr. Good night darlin one. Che bello entrare nel tuo blog, mi piace tanto leggere i tuoi post!!! Hey beauty! Have a great weekend! Have a lovely weekend Launna. I'm happy for you. I've been let down many times in my life, but I refuse to stop sticking my chin out. I refuse to stop believing the best of people, and I refuse to stop giving them my trust. Doesn't mean I'm never disappointed, but the good experiences far outweigh the bad. And when you come right down to it, who can ask anything more? hard to get through life without someone or someones taking advantage of us. I' always tell my kids that there are more good people than bad and like you said, we can only live our best lives and in doing that, hopefully more and more of the good people will be attracted to us than the bad. Hugs Launna. Stay strong and steady. I'm glad that you can trust again. Some amazing quotes you've found too. I hope you keep fit for your journey. Mentally and physically...oh cold winter is coming and that alone can make us weary. You are in my thoughts and prayers. Sono ripassata per portarti un carissimo saluto. I think that you are going the right way. Have a great weekend pretty! Dropping real quick to say happy weekend dear Launna. Quando passamos por uma situação complicada ficamos abalados em vários sentidos. Um desses sentidos é a confiança com as pessoas que conhecemos. Mas, dá pra saber em quem confiar só observando! Se alguém está fingindo ser uma coisa que não é, logo a máscara dela cai. Stopping by to say hello Launna! Hope you are having a good weekend dear! I caught the stupid cold my son had all week and have been taking it easy big time to recover. I am not saying that people aren't trustworthy, it is just how comfortable I could be that makes me talk about myself to some one. Great post as usual. Take care. Ciao, carissima Launna, buona settimana. It's strange. I thought I have commented on this post before but I don't see my comment here. Maybe the WWW ate up my comment or I closed the page too soon or my network went down. It happened to me a few times lately. I guess we all wear masks all the time. It has become a habit. It is true that sometimes I feel most myself on my blog and others' blogs too for the very same reason you mention. There are definitely people out there who are trustworthy and yup, it doesn't mean that all the people you meet form now on would behave the same way as those people in the past. I guess it is important to keep an open heart and mind and slowly let your heart guide you into trusting the right people. Lovely words. It's true that everybody wears masks in their lifes, and only one or two people really knows you enough, without masks. I think we've both been looking for the same thing Launna. Launna, don't get discouraged for not handling change as good this past week! I mean, the world was not built in one day! have pacience with yourself, the important thing is that you are aware of the things you want to change about yoursself and working slowly towards your goals :) believe I'm not very good with change either and I freak out pretty easily! specially at work haha so I know exactly what you are saying! In regards to showing someone different to people you don't know much yet, I think is super normal, we all do it, we wear masks as you said, which is not a bad thing. Sometimes I feel happier or more mature depending on the friends I'm hanging with, I think personalities are so complex that we could be anything we want! Thank you so much for sharing all your thoughts and feelings in such deep posts :) I always enjoy reading them! and thanks for visiting my new site, I'm sorry it didn't work out great for you and you couldn't comment on it. I already emailed the guys that helped me set it up to see what is going on with that! Hopefully the next time you try to comment, it will do it with no problems! Good to know that you are making steps forward dear! Sometimes you have to let go the past and look to the future! Love the way how strong you are! :-) Keep it on! To trust again is so hard. I don't know if we're are ever 100% once it's been lost. It's like drinking out of your favorite mug which was broken but you were able to repair it. You still have to be careful with it, and it's just not the same as before you broke it. yes, changes begins with you, with me. within oneself. many people do not realize that and search for luck and happiness in others ... and are totally destroyed and disappointed when it comes to a breakup or reality. one has to love oneself. one has to accept oneself and cherish what one is. YOU are precious, dear launna. one day, someone will come along who will see that. and that will be the one you can trust, with all your heart. by the way: it's amazing to hear that valentina has gone vegan - congrats on that! i had to stop it, because my body couldn't cope with it.